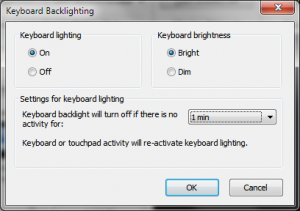 I have recently read a few posts on other blogs and forums, discussing an ‘annoyance’ of not being able to disable the ‘fade-out’ or time-out period of the keyboard back-lighting after one minute of no keyboard or mouse activity. However, what most don’t realise, is the option is available… just buried. I am using Windows 7, so I would assume the following steps would be more applicable to Vista, but not so much Windows XP. This is also based on a Dell Studio 15 and Dell Studio XPS 16 laptops so I can’t guarantee it applies to all Dell Laptops with back-lit keyboards/touchpads. 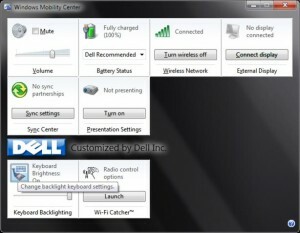 Open Windows Mobility Center (Just search it in the start menu, it only appears on portable devices such as laptops). You should be presented with a screen like below. Notice as Quickset is installed, a few extra options have appeared at the bottom of the window. If you do not see the Customized section by Dell, download Quickset from the Support and Drivers section of the Dell website. While the ‘Keyboard Brightness’ panel only shows a slider bar, notice the small Laptop & Keyboard icon just above the slider is pressable (focused in the screenshot above). Clicking this will open a new dialog box like the screenshot below, with more customization options for the keyboard back-lighting. You can now adjust the time-out for the keyboard lighting in-activity fade out. Adjust the time interval by selecting it from the drop down menu, or specify “Never Off” to set an infinite timeout period. Let us know if this works for your Dell laptop. And yes, that should work for all the newer machines with backlit keyboards (I have an M6400 Covet and it works there under Vista). Yes, this works on my Dell Studio 15 (1555). Thanks for this. I’ve been looking for the way to set this for weeks since my laptop was delivered. Thank you! It worked and was easy to find with these simple instructions. Studio 1558. It works on my XPS L501X. I also had poked everywhere I could find to change this setting. Dell should make it default to 5 min. instead of 1. Thank you! BTW, I really like this model, 15″ with the aluminum lid. Please, can someone send me a link for Studio 1537, because I can’t find a right link for download. Works on XPS 15 (L502X) — thanks! Thanks a bunch man, was looking to see if this was possible and it is! Also changed the function buttons to multimedia buttons instead within the mobility center seeing how the keyboard has changed from my old xps (1x) to my current (2x). Wow! Thanks! I called Dell Tech Support two years ago when my M4400 was new and again today (two days before my warranty runs out) and both times they were clueless on how to fix this annoying problem. Now, the keyboard backlighting is finally working as it should. Blessings! I have a Dell Latitude E6430, I cannot locate the Correct QuickSet nor do I see the E6430 as a compatible… any ideas? Wow, It work on my Dell Inspiron 7568 2in1 2016. My Windows Mobility Center has no box for keyboard brightness. My keyboard back lighting used to come on when I stopped typing but now does not do that at all, I changed nothing. Fn and F10 doesn’t work either, nor Ctrl Fn Z, nor Fn Z.
Settings->System Configuration->Keyboard … 3 lines of setting here for full config.